On September 3rd, the Sand Key Civic Association will meet at the Clearwater Sailing Center at 7 pm. Red tide, Shoppes of Sand Key zoning, and Cabana Club development are on the agenda. The Clearwater Planning Commission meeting scheduled for August 19th to review the Cabana Club project has been postponed until September 16. A staff report was released indicating the proposed code deviations be granted with certain conditions. The complete report is available from the Clearwater City Planning Department. 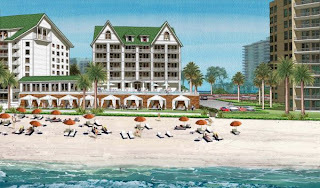 On Tuesday, August 19th the Planning Commission will consider code deviation requests and review opposition to the project by Sand Key residents. Legg Mason Real Estate Investors, Inc. purchased the Biltmore properties in 2007. The Cabana Club is the "beach resort" for the Belleview Biltmore. Renovation plans include a 1.5 mile ferry ride to shuttle guests to the club where they could enjoy the white sand, pool, and cabanas. Renovation of the club is expected to take 16 months. Local residents oppose the project, claiming the area is not meant for commercial development and that the plans violate building codes. Also of concern is obstruction of thier gulf views and parking issues. One variance they are requesting is a setback reduction along Gulf Boulevard. An increase in height of 25 feet to 67 feet is also being requested. 2 properties at 1350 and 1370 Gulf Boulevard have received variances to 80 feet within the past three years.